New Silks Roads. © The Wall Street Journal. 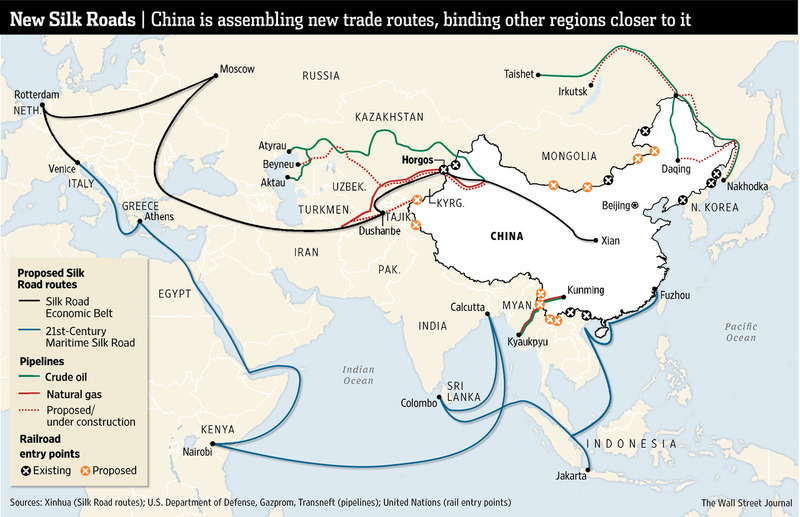 The New Silk Road is the huge Chinese response to the US attempt to isolate Beijing via the Transpacific (TPP) and the Transatlantic (TTIP) agreements, whose fates are still very much in the balance. But it is much more than that. It responds to a clear geopolitical and geoeconomic vision from China, and in particular from President Xi Jinping who launched it in October 2014. There is no improvisation and much advance planning in this globalisation à la chinoise. In the foreseeable future, the US will continue to control the sea lanes that China most uses and therefore the latter must open up others both by land and sea (15 of the 20 largest ports in the world today are in China) to guarantee the transport of its exports (for some it is prohibitively expensive by air) and supplies of raw materials, especially those related to energy. The project involves the whole of Asia, the Gulf, Middle East and North Africa and Europe. Last week a US ship challenged China’s sovereignty claim over some islands in the South China Sea while Madrid, in a grand exercise of economic diplomacy and soft power, hosted the second Silk Road Forum, with a heavy Chinese presence and the participation of think-tanks from many of the countries involved in this huge project. For China, it also has an internal goal: to develop its territories inland and to halt the exodus towards the coastal areas where economic growth is concentrated. The New Silk Road, also known as ‘One belt, one road’, aims to benefit 4,000 million people by opening up new routes from China to Europe, with five ‘economic corridors’ (China-Mongolia Russia, Central Asia, China and Pakistan, China-Myanmar-Bangladesh-India and ASEAN, and to the East, a sea route to South Korea and Japan) and then into the Gulf, the Middle East, North Africa and Europe. Some of the countries involved have no opening to the sea (such as Mongolia, Tajikistan and Afghanistan, among others) and for them it implies global ‘connectivity’, the key word. Others, like Pakistan, will be able to move further apart from India (though the latter is also involved in the project). Unlike the TPP and TTIP that do not cost money (although they may accrue much in lawyers’ fees), creating the New Silk Road requires huge investments in infrastructure amounting to around a trillion US dollars, according to The Economist, and involving all manner of facilities including railways, roads and ports. A portion of the capital needed, given the overall need for austerity, will be private investment, but the bulk will be public. China has created a special fund for the project of US$40,000 million. It has also launched the new Asian Infrastructure Investment Bank (AIIB) with the participation of over 60 countries and can count on the ‘Eurasian transport corridor’ promoted by Putin –Russia is heavily involved– while it also aims to connect to the EU’s Juncker Plan. The heterogeneity of the countries participating and the harmonisation of technical standards, tariffs and non-tariff barriers will generate enormous problems for the creation of what some describe as a ‘regional public good’, but with which they all seek to gain a productivity boost to avoid getting caught in the ‘middle income trap’, as presented by the OECD’s Development Centre. It is expected that by the year 2030 the new routes will be ready, although not yet fully operative. Besides infrastructure, the project aims to promote four types of ‘connections’ or flows: political, trade, capital and people. And there is a certain intellectual and even ideological challenge involved, as China seeks to promote in the economic sphere what it calls the ‘Beijing Consensus’, as opposed to the neoliberal ‘Washington Consensus’ (which is not, however, Obama’s). For Spain the project is very important not only for its infrastructure and engineering firms, but also because it will allow it to have a direct connection to China and Asia, the economy of the 21st century, as described by the Secretary of State for Trade Jaime García-Legaz and the Foreign Affairs Minister José Manuel García-Margallo. The connection existed many centuries ago with the Old Silk Road, when Spain had not even become Spain yet. If it goes ahead, the world will have three major economic axes: the Pacific, the Atlantic and the route between the East and the other end of Eurasia. Outside them would remain sub-Saharan Africa and parts of Latin America and that would not be desirable. Perhaps to compensate it would be appropriate to revive the Atlantic Basin initiative between the Americas, West Africa and Europe.